On Thursday, April 20, 2017, Stephen Moore, Contributing Editor for The Wall Street Journal and Senior Economic Advisor to the Trump administration, visited his Alma mater, the University of Illinois at Urbana-Champaign to present on Economic Policy within the new administration. His presentation can be seen here. A new CBO report on the Affordable Care Act was recently released. One of the findings, described in an Appendix, is that the implementation of the ACA would result in about 2.3 million fewer full-time jobs by the year 2021. Most of this would be due to workers voluntarily cutting back on work. This has created quite a stir, with some arguing that the ACA is bad for the economy while others arguing that as long as it’s the workers making the decision, there’s nothing wrong with lost jobs. Jon Stewart tried to point out the hypocrisy of Republicans who rallied against “job lock” in previous years, but are now pointing to the CBO report as evidence that Obamacare is bad for the economy. But Jon appears to have misunderstood (as probably other many people do) the exact meaning of “job lock” and the difference between it and what the CBO finds. Job lock arises because health insurance on the individual market is much more expensive than what an employer typically pays for it, partly because of the tax deductibility of employer premiums and partly because adverse selection used to be a bigger problem on the individual market (we’ll see if that remains true now). Moreover, workers with pre-existing conditions may have not been able to get health insurance at all if they left their jobs. These conditions create incentives for workers to keep working at their current job mainly for the purpose of maintaining their health insurance coverage ( = “job lock”). It’s certainly likely that the Affordable Care Act eliminates some job lock. But it also does something else. By tying premium subsidies to income, the government is effectively creating incentives to work less. This has nothing to do with job lock – it’s called “moral hazard,” and most economists would agree that it’s a bad thing. And it’s not a hypothetical effect that evil people made up as an excuse to not help people get health insurance. Several empirical studies, cited by the CBO, find that it exists and is significant. Most of the estimated reduction in employment appears to be coming from moral hazard rather than the elimination of job lock. Thus, the voluntary reduction in employment is not something to cheer about, but something to view as a cost of the Affordable Care Act. For more, see Casey Mulligan’s discussion of how to think about this loss of jobs. Bloomberg recently published a series of articles criticizing the United States crop insurance program. Given my own interest in insurance generally and crop insurance specifically, I wanted to address some of the claims made by the articles. There is no doubt that the federal crop insurance program is very flawed, with the largest flaw, by far, being the insane premium subsidies. Farmers currently pay less than half of their premiums, on average, with the rest being covered by the government. Moreover, between 1990 and 2009, Congress has routinely passed additional legislation giving special payments to farmers who suffered crop losses due to disasters. However, there two features of crop insurance that Bloomberg portrayed as negatives but that are actually positive. First, one article quotes an “uneasy” beneficiary as saying, “I like to think of myself as an independent who’s willing to take risk. [...] With insurance, it takes the risk out of it.” This is actually a good thing from society’s point of view. No one goes around saying, “Man, things are just not fun anymore now that I have health insurance. If I fall down and break my leg, I no longer have to spend thousands of dollars.” The notion that farming should remain risky is simply misguided (of course, farmers are free to forgo insurance if they wish). Second, the fact that “more than seven in 10 policies guarantee income rather than yield” is actually a good thing from an insurance point of view. Farmers care about their income rather than just about how much corn they have. They face both the risk that their yields will be low and the risk that prices will be low. Considering the two in combination rather than focusing on yields alone is preferable from the point of view of risk reduction. So the real problem with crop insurance is not that it takes the risk out of farming, but that it is heavily subsidized by the government and supplemented with extra disaster payments. The subsidies have previously been justified by the adverse selection that would result if premiums were not subsidized. However, a much cheaper way to deal with adverse selection is to mandate that every farmer buy insurance. There are probably better things to do with taxpayer money (for example, see this recent National Review article). Earlier this year, I co-authored a proposal with four colleagues to reform the Illinois State Universities Retirement System. My motivation for doing so was quite simple: the fiscal crisis facing the state of Illinois is very real, “doing nothing” is not an option, the politicians seemed to be making little headway on a solution, and the ideas that were under consideration appeared to be driven far more by ideology than by concern about good retirement policy and good fiscal policy. Given that I have spent the past 15 years of my life developing academic, policy and practical expertise on issues related to retirement income security, I thought I owed it to Illinois taxpayers to make a serious attempt to bring some balanced, centrist thinking into the discussion. My four co-authors brought exceptional expertise in areas of university administration, benefits design, state and local public finance, and other highly relevant topics. Together, we proposed six specific reforms to the SURS system. Our “Six Simple Steps” proposal was subsequently endorsed by the Presidents and Chancellors of all of the public universities in Illinois. It has also received favorable feedback from many participants and retirees. Over the summer, our proposal gained serious political traction when the bicameral, bipartisan pension committee of the Illinois General Assembly began to treat it as a leading possibility for breaking through the political logjam that had stifled prior attempts at reform. Now that our proposal – which is sometimes referred to by others as the “Universities Plan” or the “IGPA Plan” – has gained traction, the political knives are coming out on both sides of the ideological divide. This is not surprising: under our proposal, faculty are being asked to contribute more, retirees are being asked to receive less, the universities are being asked to take on greater financial responsibility for future costs, and the state is being put on the hook for paying down the enormous unfunded liability. There is plenty of pain to go around. We did not cause the pain, of course. The pain was caused by many generations Illinois General Assembly members who failed to behave with even a modicum of fiscal responsibility. We are just asking legislators, participants, retirees and taxpayers to be honest about the severity of the problem and to take meaningful steps to stop the fiscal bleeding. But, in a highly politicized environment, with billions of dollars at stake, I am not at all surprised that ideologues and interest groups are pulling out their knives and trying to cut down our proposal. So allow me to let you in on a little secret – I don’t love our proposal either. A few aspects of it leave a bad taste in my mouth, in the same way that some life-saving medicines do. However, I honestly consider to be the best – by far – of a wide range of distasteful options. Let’s be honest: If I lived in a state where the state government was not dysfunctional, where we did not have strictly binding constitutional constraints, and where we could draw up our pension system from a relatively clean slate, I would NOT design a system exactly like the one we are proposing. Rather, I would commit the state to a credible funding path; I would raise the normal retirement age to be in line with Social Security; I would fully index benefits to inflation and, if needed, pay for it through downward adjustments to initial benefits; and I would align incentives by making the entities responsible for hiring decisions (e.g., the universities) also be responsible for paying the full benefit costs associated with those hiring decisions. While I am dreaming, I would also require the state to use accounting rules that transparently communicated the real economic cost of pensions, rather than hiding the true costs behind intellectually flawed government accounting standards. Then again, if I lived in such an ideal world, we probably would not be facing the worst pension funding crisis of any state in the nation, and our proposal would have been unnecessary in the first place. But we, the residents of Illinois, do not live in such a world. Rather, we live in a state where for many decades our political leaders have failed to make good on the state’s most basic financial obligations. As a result, the time has come for us to take our fiscal medicine: everyone must make sacrifices. Unfortunately, the very constitutional protections that were intended to protect retirees now prevent us from enacting the most sensible reforms (such as raising the retirement age, which nearly every serious analyst agrees is a good idea): instead, we are forced to use second-best policy tools (such as reducing COLAs) simply because they have a better chance of passing constitutional challenge. And we live in a state where after several unproductive years of debate, various powerful politicians have made it crystal clear that certain types of reform are political “must haves” and others are “cannot haves,” a situation that further narrows the realm of politically feasible options. First, neither critique provides a truly serious alternative that is politically, legally and fiscally realistic. Second, the criticisms are striking in the extent to which they are mirror-images, taking precisely opposing views to one another. The first of these critiques was offered by the Illinois Policy Institute. They criticize our plan for preserving the DB system, not moving fully to a DC world, not eliminating COLAs, not saving enough money, and taking too long to phase in the changes. The second of these critiques is by a researcher at University of Illinois at Chicago and the head of Keystone Research Center. They criticize our plan for not preserving the DB system in its entirety, for suggesting the introduction of a DC element, for partially reducing COLAs, for asking the state to pay down the unfunded liability too quickly and for cutting benefits too much. And, in an amazing feat of mental gymnastics, they also suggest that by reducing spending the plan will somehow raise costs to the state. To the extent we were trying to design a proposal in the “sensible center” of this debate, I will take these completely offsetting criticisms as confirmation that we are on the right track. Here is a brief table summarizing how the two critiques often negate each other, in their own words (followed by my parenthetic and italicized remarks summarizing their view in my own words). I can understand why those who advocate for the smallest possible government would be disappointed with a plan that does not squeeze out even more savings from the pockets of public sector workers. I can also understand why some public sector workers and retirees would oppose any benefit reduction. But such extreme views, while potentially useful for advocacy purposes, do not make for good public policy. The above comparison make it self-evident that these two critiques are attempts to bolster opposing untenable positions: the Illinois Policy Institute would prefer that we decimate retirement security, and the KeyStone group naively acts as if we can solve this crisis without meaningful changes to benefits. Supporters of both positions will be disappointed with any realistic proposal that actually solves Illinois’ pension problem while preserving retirement security of public workers. You may not like our plan. As I noted earlier, I am not in love with it either. But I still think it is the best idea out there so far. Very little in the Illinois Policy Institute or Keystone critiques alters my view with the exception of continuing the existing Self-Managed Plan as a voluntary option for some new employees, as suggested by the Illinois Policy Institute, although I do not think it is the best choice for the median employee. I am totally open to the possibility that better ideas than ours may still be out there – and if either of these two groups (or any other group or individual) have substantive suggestions that are fiscally responsible AND politically feasible AND constitutional AND not unduly harmful to public employees, I would love to hear them. So far, however, I continue to believe our Six Step proposal is the most serious proposal on the table. Like millions of Americans, I was deeply shaken by the horrible tragedy that unfolded at Sandy Hook elementary school in Newtown Connecticut one week ago today. As a father, as an American – simply, as a human being – I was horrified by the thought that anyone could be capable of gunning down innocent and helpless children. My rage toward the killer was outweighed only by the terrible sadness for the children and deep sympathy for their families. As the hours and days have gone by, however, my raw emotional response has slowly – if not fully successfully – made some room for my inner economist to begin to examine the situation from an analytical perspective. Today, Wayne LaPierre, the head of the NRA, stated that “the only thing that stops a bad guy with a gun is a good guy with a gun.” This is a provocative statement, so I thought it was time to examine this issue more closely. I would like to assume that, with the exception of a few sociopaths, everyone wants our children to be safer. I do not subscribe to the extremist rhetoric from either side that assumes they are the only ones with the moral high ground and that the “other side” is somehow anti-kids. Rather, I think both sides agree on the goal – to keep our kids safe – but have a very different view of how to get there. But who is right? Would our children be safer with more guns or fewer guns? To provide some insight, I would like to adapt a simple model that is used to discuss tax policy (stay with me here!) – the “Laffer curve.” (Click here for information on the Laffer curve). If there were zero guns available in the U.S., then by definition there would be zero gun-related deaths. Starting from zero, as the number of guns increases, the frequency of gun related deaths would surely rise, at least initially. But it probably would not rise forever as shown in this graph. Why? Consider the other extreme – the vision of the NRA – where virtually every citizen was armed. Teachers, professors, airline pilots, nurses, truck drivers, accountants … everyone. According to the NRA, in such a world, criminals would be reluctant to commit a crime because they know that they would be putting themselves in grave danger. Or even if they did, an armed good guy would stop them. What this means is that if gun violence is low at low levels of gun ownership, and also low at high levels of gun ownership, then there must be a horrible “peak” in between where the number of gun-related deaths is at its highest (the peak). 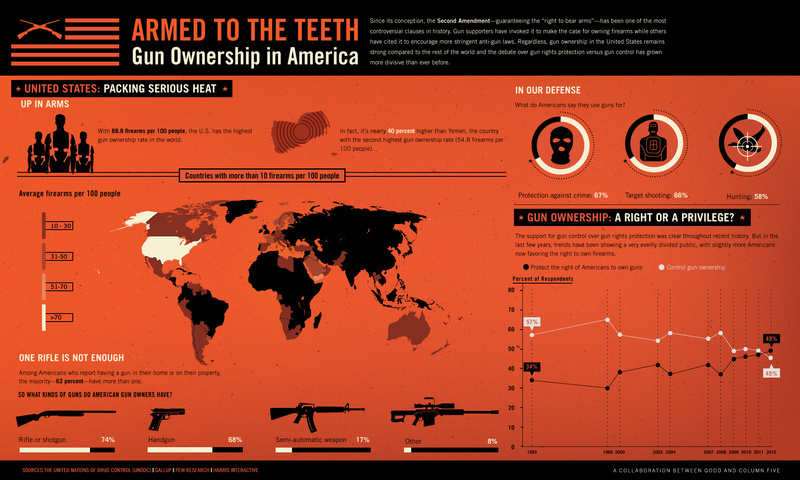 We have over a quarter of a billion guns in the U.S. The question is whether this is above or below the peak. 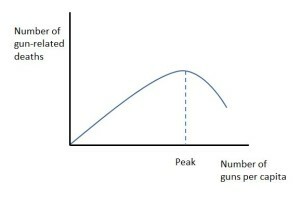 If it is below the peak, then more guns cause more gun-related deaths, and deaths would decline if we had more effective gun control laws. In contrast, if we are above the Peak, then small decreases in the number of guns can actually cause more deaths. Relatedly, if we are above the Peak, then increasing the number of guns can reduce the number of gun-related deaths. This is what the NRA seems to believe. This is a simplistic model. But it does provide an important insight: theoretically, gun control could make us safer or it could make us less safe. Gun control advocates are implicitly assuming we are to the left of the peak. Gun rights advocates are implicitly assuming we are to the right of the peak. The good news is that it is possible to test this. The bad news is that it is very hard to do it well. One cannot simply assert that “in country X, they have tighter gun control laws and also fewer gun deaths, so therefore fewer guns causes fewer deaths.” To do so would be to ignore countless other factors – cultural, religious, legal, economic, demographic – that might cause country X to have fewer deaths and also cause them to pass more stringent gun control laws. University of Chicago economist John Lott is the most well-known researcher on the issue. His findings are easily summarized by the name of his book “More guns, less crime.” In other words, Lott believes we are way past the peak and that people would likely be safer if we had fewer restrictions on guns. As is often the case when someone writes something so provocative, Lott’s research has come under attack. A summary of the controversies and criticisms can be found here. Aside from just attacking Lott’s work, others have tried to examine this issue on their own. In my opinion, the single best study on this topic was conducted by Prof. Mark Duggan, a Harvard-trained Ph.D. in economics who is now a professor at the Wharton School at the University of Pennsylvania. His paper, “More Guns, More Crime” was published in one of the most elite peer-reviewed economics journals in the world. He finds that “changes in homicide and gun ownership are significantly positively related” (thus, his title – more guns lead to more crime.) Importantly, he also finds that “this relationship is almost entirely driven by the relationship between lagged changes in gun ownership and current changes in homicide.” This is really important because it is evidence that this correlation comes about because guns lead to more homicides, rather than an increase in homicides leading more people to buy guns. The Duggan study also specifically examines the Lott study. He agrees that, theoretically, concealed carry laws could increase the likelihood that potential victims could carry a gun, and thus reduce the homicide rate (my simple model above). However, he concludes that he finds “no evidence that counties with above-average rates of gun ownership within CCW states experienced larger declines in crime than low-ownership counties did, suggesting either that gun owners did not increase the frequency with which they carried their guns or that criminals were not being deterred.” In other words, there is no evidence to support the NRA’s view. I came into this debate over the past week with an open mind. My reading of the evidence, however, suggests that more guns cause more crime, and that concealed carry laws would not reduce crime. Our nation may still decide not to restrict guns because of the Second Amendment. But if so, let’s at least do it with our eyes open. We should not be pretending that we are helping kids by promoting gun ownership. Earlier this week, I released a report co-authored with Avijit Ghosh and Scott Weisbenner (both of the University of Illinois) and Steve Cunningham (Northern Illinois) that – yet again – tries to make the case for pension reform. The news release can be found here and the full paper (including a one page summary) can be found here. 3. Expand the Illinois state income tax base to include retirement income. There is really no compelling economic reason to exempt retirement income from the Illinois state income tax, and this may be the only way to get the retired generation to be able to contribute to solving our fiscal problems. Whether or not our proposal has an influence on the debates in Springfield is anybody’s guess. But one thing is clear: absent some time of substantial reform, Illinois is teetering close to a true fiscal cliff, one that will make the Washington DC fiscal cliff look like a small step down.